Fox News contributor Erick Erickson is aggressively lobbying for a "religious freedom" bill in Georgia that would create a broad license to discriminate against LGBT people on the basis of religion. 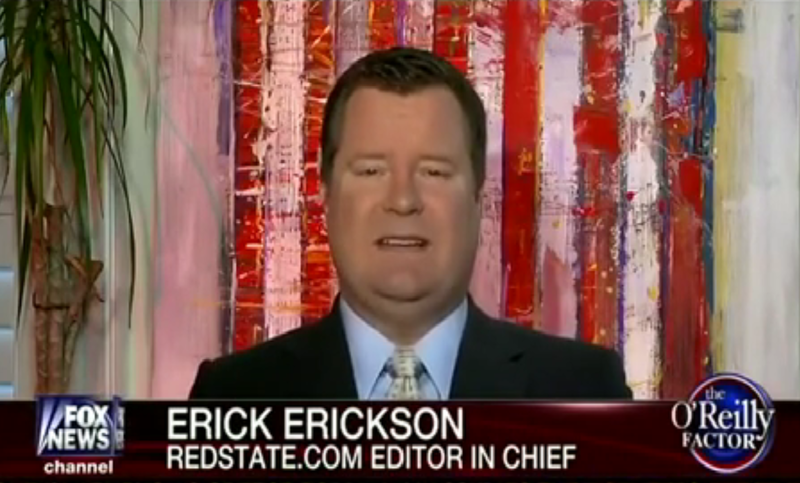 For the past two months, Fox News contributor, RedState.com editor, and radio host Erick Erickson has been relentlessly campaigning for the passage of SB 129, a so-called "Religious Freedom Restoration Act" (RFRA) that has already passed the Georgia Senate. The proposed RFRA would enshrine the ability of businesses and state employees to refuse service to LGBT people. Southern faith leaders, religious liberty scholars, businesses and even some conservative lawmakers have publicly denounced RFRAs over concerns that they would create a blank check for anti-gay discrimination. If you are not willing to pick up the phone, we will lose. Our religious liberty protections in Georgia will start being eroded by left-wing activists inside and outside the judiciary. Start calling now. Insist they tell the Speaker to bring S.B. 129 to the floor immediately without amendments. Your right to worship and practice your beliefs is on the line. And yes, it can happen here in Georgia. Erickson has also falsely claimed that, without RFRA, local non-discrimination ordinances will force churches to build unisex bathrooms and dictate that "a man who says he's a woman should be able to use the women's bathroom;" in fact, churches are largely exempt from non-discrimination laws. On March 18, Erickson announced that he will be recording calls to constituents in several districts across Georgia, especially in areas where he has "a regular media presence:"
It is the perfect robocall for a state whose elected officials claim not just to be "Republican", but to be Christians and conservatives. We're moving from "make them see the light" to "make them feel the heat." It is no surprise that Erickson is working to rally his supporters behind this type of license-to-discriminate legislation, given his cozy relationship with the extreme anti-LGBT organization Alliance Defending Freedom (ADF). ADF is a multi-million dollar organization that works with "2,400 allied attorneys" nationally to draft and pass RFRA laws. As CNN put it, ADF has provided the "genetic code" behind RFRAs across the country. Erickson has long been a vocal supporter of ADF - their "religious freedom" work so inspired him that he previously begged readers of his RedState.com blog to donate money to the organization. The close relationship between Erickson and ADF is a two way street - ADF hosted "An Evening with Erick Erickson" that focused on the "increasingly aggressive attack" on religious liberty. Just recently, in lobbying for SB 129 on his March 5 radio show, Erickson hailed ADF as a "wonderful wonderful organization" that "defend[s] Christians." With their mouthpieces at Fox promoting their narrative of Christian persecution, ADF has helped craft a number of RFRA bills being considered in states across the country. It remains to be seen if Erickson will continue his role as ADF's cheerleader in its mission to enshrine anti-LGBT discrimination in the law one state at a time.